The correct use of indicators / signals is important not only to let other road users know your intentions, but is also something that the examiner will expect on the module 2 riding test. Mistimed, badly judged or failing to cancel a signal is something that can easily fail a module 2 motorcycle test. Signaling allows other road user to prepare for your actions making it safer and more convenient for all road users. You must signal your intentions to account for drivers of other vehicles oncoming or following, cyclists and pedestrians. Where it is necessary to inform other road users of your intentions. Moving off from a parked position where other road users may benefit from a signal including pedestrians. Junctions, left and right turns are a must as is changing lanes. You must signal only when it is safe to do so, by checking the relevant mirror first, followed by a over-the-shoulder check if necessary (mirror blind spot) and if you then determine it is safe to perform the manoeuvre, then indicate. If an action requires a signal, always indicate before slowing down, braking or changing road position. It’s important to ensure your signals are clearly understood by other road users and that they do not have two meanings. An example can be passing parked vehicles on the right. You may need to move onto the right-side of the road to pass the vehicles. Signaling to the right may cause confusion to other road users who might mistake your signals for your intention on making a right turn. Timing of signals is important. Give signals early enough to allow other road users time to see and act on them. Avoid giving signals too early as this may be misleading for road users. 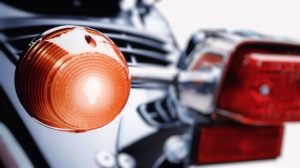 Your motorcycle may not have self-canceling indicators and regardless of whether it does or not, you still must ensure that your signal is cancelled when the manoeuvre has been completed. This is a common test failure as it can cause confusion to other road users. During the module 2 riding test, the examiner will be watching you to ensure you give signals in good time, give appropriate signals so not to cause confusion and that indicators are cancelled once the manoeuvre has been completed.